In medium size pot boil hot water and add quinoa cooking for 15 minutes. While quinoa is cooking take a preheated skillet add 1 teaspoon of olive oil, then add your onions and jalapenos letting them sweat until they turn translucent. As soon as jalapenos and onions are cooked and golden set aside. In same large hot skillet add remaining 1 teaspoon olive oil then add the chicken tenderloins. Add freshly ground pepper and sea salt. Cook and turn getting each side until golden cooking until juices run clear. 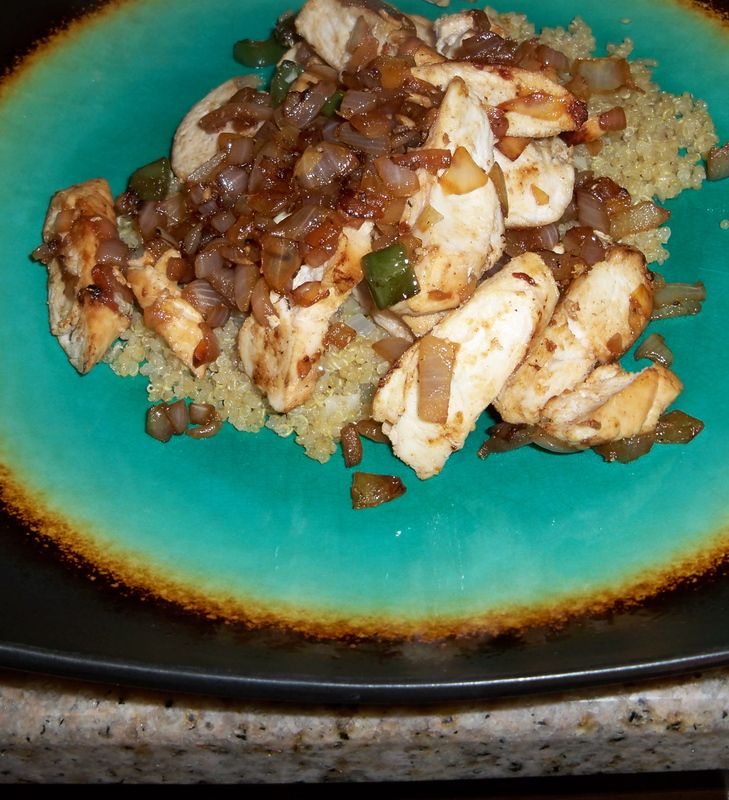 Take a 1/2 cup of quinoa on each plate 3 chicken tenderloins and top with onion jalapeno mixture. As we are cooking the jalapenos they are not real hot or spicy. If you want it more spicy add more jalapeno seeds. Thanks for the recipe. It sounds great. Have to go buy some Quinoa. Looks east and quick too. Thanks again. So great to hear you will be picking some up. Some tips for buying quinoa are it is more affordable in the bulk section then getting it in the box variation. It is so high in protein and low in fat. A wonderful South American Grain. Super quick and easy. Take water to a boil and add in quinoa bring to a boil again and reduce to a simmer for 15 minutes covered and your done. 1 cup of quinoa to 2 cups of water. Enjoy and thanks for the visit! Loved this recipe. Yum is all I can say!